Rotary Club Of Warwick » Blog Archive » A sacrifice well made! Mar2 - A sacrifice well made! 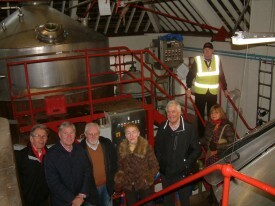 Warwick Rotarians undertake many duties in their daily lives and a party of them were recently obliged to make a visit to Hook Norton Brewery in Oxfordshire where, after a tour of inspection it became necessary to sample some of the products before departing to a local hostelry for lunch. The picture shows some of their happy faces during the tour and before the sampling session.